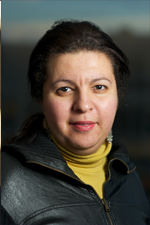 Research Interest: Dr. Caliskan's research interests include the emerging science of bias in machine learning, fairness in artificial intelligence, data privacy, and security. Her work aims to characterize and quantify aspects of natural and artificial intelligence using a multitude of machine learning and language processing techniques. In her recent publication in Science, she demonstrated how semantics derived from language corpora contain human-like biases. Prior to that, she developed novel privacy attacks to de-anonymize programmers using code stylometry. Her presentations on both de-anonymization and bias in machine learning are the recipients of best talk awards. Her work on semi-automated anonymization of writing style furthermore received the Privacy Enhancing Technologies Symposium Best Paper Award. Her research has received extensive press coverage across the globe. Aylin holds a PhD in Computer Science from Drexel University and a Master of Science in Robotics from the University of Pennsylvania. Before joining the faculty at The George Washington University, she was a postdoctoral researcher and a fellow at Princeton University's Center for Information Technology Policy. Research Interest: Professor Robert Pless conducts research in the area of computer vision with applications to environmental science, medical imaging, robotics and virtual reality. He is particularly interested in studying data-driven and geometric techniques to more robustly understand images taken “in the wild.” This research exploits the fact that cameras are incredibly precise measurement systems: if they are calibrated properly, then the vast quantities of visual data they collect can help us learn, understand, and manipulate the world around us. At a high level, the current themes of research in his lab are: understanding visual change at scales from the sidewalk to the planet, studying next generation imaging systems for virtual reality and robotics, and democratizing visual analytics with applications to social justice.